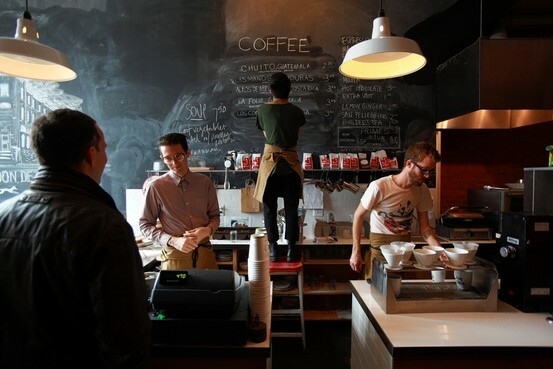 Astro Coffee in Corktown, a Detroit neighborhood luring new businesses. At the ragged corner of Michigan Avenue and Trumbull Street in the historic neighborhood of Corktown, where the Detroit Tigers played for 87 years, all that remains is a slice of an entrance gate, a flagpole and a barren field. After the last out in 1999, the Tigers departed what locals call "the Corner," for the new Comerica Park downtown. The American League champions host baseball's World Series there this weekend. Back in Corktown, redevelopment proposals for the surrounding blocks foundered, and when Tiger Stadium finally was razed in September 2009, many feared the neighborhood would be lost to history. But Corktown is stirring again. Young entrepreneurs have homed in on Corktown's main drag, which is now dotted with small businesses: a nationally acclaimed barbecue joint, a burger bar, a craft-cocktail nightspot and a hip coffee shop. A few boutiques selling sports apparel and vinyl records have sprouted along blocks that were once largely shuttered. "When the bike racks are full, you know things are humming," said Dave Steinke, owner of the new Mercury Burger Bar, who plans to open an Italian restaurant on Michigan Avenue next month. "When you see some strollers on the street, you know they'll be back again and again." Corktown—named for County Cork by the Irish farmers who settled there in the 1800s—isn't bustling, local boosters concede. But for Detroiters, the seeds of commerce in an area left for dead are sparking hope that some of the city's most forlorn neighborhoods can be resurrected. That hope hasn't touched other neighborhoods. New stadiums, office buildings and hotels have helped Detroit's downtown area recover from its gloomiest days. But farther out, residential and commercial corridors bear deep scars of population loss and business flight.